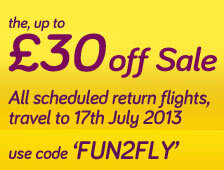 Monarch Flights offers yet another promo code for 25£ discount off return flights in Europe. Type the code in the payment page, immediately above the total price on the right side of the page. When you make the booking, be aware that it's NOT mandatory to choose your seat: that costs extra and if you do not mind risking not being to able where you are seated, you can save another 10 pounds per person.